Can Your Raid do More With Less? Its a dark and stormy Monday night. Rain drops are slowly streaming down my face as I wearily walk through the door. I kick off my shoes and my feet are practically screaming in glee after escaping the cold, damp prisons of my New Balance sneakers. I hustle straight to my computer and flip the switch on. As the machine slowly spins to life, I change into something drier and comfortable. I received a chorus of acknowledgements ranging from “Good, what are we doing?” to “Your mom”. Just another day in Matt’s guild. Once I logged into a game, I noticed of activity in officer chat. During the minutes that lead up to the first pull, we’re constantly assessing our roster and determining what bosses to aim for. One of the initial steps is to see what our attendance is like. There are times where there are some last minute player signouts or late notices. I got my raid invite and took a mental stock of our roster. 23 raiders with no other players in sight. It was about time for first pull. Some were starting to wonder if we would go since we didn’t have a full raid. The only boss remaining was Lich King. We wanted more weapons. “We have the tanks to do this.” My tanking officer reported. I quickly assessed my healers. There were five of us. We normally took six. I felt we could operate with less but I’ve always preferred the extra safety net when we were short bodies. It was time to get out of the comfort zone and see what the healing unit was capable of. “It might be choppy. Being down two isn’t going to help. I think we can pull it off.” I responded with confidence. 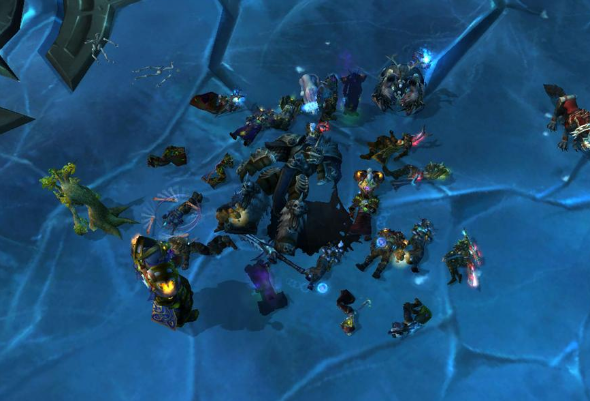 I’ve always wondered what the minimum number of players for taking down Lich King would be. Could he be taken down with 24? With 22? How about at 80% capacity with 20? There was only one way to find out. You’re not going to know what your raid capacity is going to be unless you actually try it. Its good to stress test the raiders in shorthanded situations because you never know when it’ll happen during future raids. Someone might disconnect early on an attempt or die halfway through it. Can your raid adjust to that sort of temporary setback? 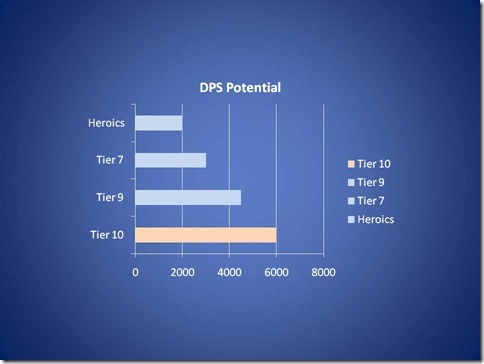 While it is somewhat simple to quantify exactly how much DPS or healing is needed to successfully get through an encounter, there are other factors which you can’t really put a number on. Things like raid intelligence, awareness, and skills are all variables that determine whether your raid has the that mentality to gut through an encounter. I’ve been surprised before in the past. When I think the raid group is lacking in certain roles or DPS and we go out and take down a boss, a little part of me inside cheers. The inverse also holds true. On moments where we wipe when I felt certain that we had the kill in the bag, I experience that sinking feeling in my stomach wondering what went wrong. You’re never going to know what your raid can do unless you go out and try it. Obviously if raid potential is far below whatever the raid requirements might be, then the unpopular decision of calling it an early night might be the better course of action. When raiding short handed, the performance of everyone else needs to go up in order to compensate for the lack of players. Unfortunately, we found out after a while what our limit was. Turns out if a player is lagging out, they’ll always get targeted with a Defile. On a side note, it seems that healers seem to respond to the instinctive need to keep healing. What else is a healer supposed to do with player who has lagged out in the middle of a Defile? Alas, with multiple disconnected players the executive decision was made to call it an early night. Better luck next week. Have you ever been in a raid where you were astonished at what the group could do because of class composition or lack of numbers? Was there any creative strategy used to get around the problems? I regret to announce that my planned post for today has to be put back to a later date. 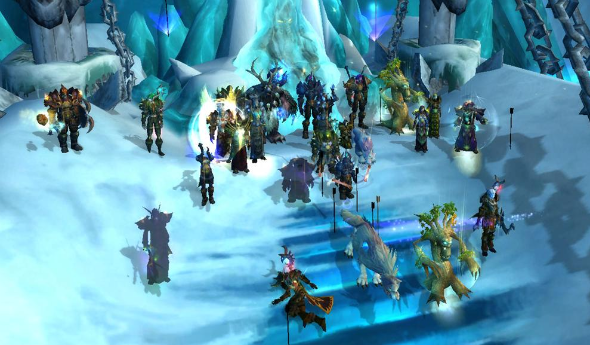 Herding Cats and friends downed Lich King 10 last night. OK, the post title was a bit of a giveaway. I’m really happy. And really proud of my group. And really excited that we got it. And really, that’s a lot of reallys. Why? Well, any guild leader or raid leader is proud when their group achieves what they set out to do. But I’m particularly fond of my group and I hope you don’t mind me rambling like a proud parent today but it’s true: we’re not your Usual Suspects, and it goes to prove that you can achieve it no matter your setup. For one thing we’re a casual guild. We only raid one to two nights a week – Sunday and every other Wednesday. We’re also not a full ‘guild’ – Herding Cats started off raiding as a real life 5 man of friends filling the spots with PUGs. We went hunting for friendly and mature instead of imbah skilled players. We ended up with a network of people to work with – and a core 10 which melded together as a single unit. Herding Cats became Herding Cats and Friends. We’ve never all been on voice comms. Some of us play in the same room, adding one or two over skype. The rset of the communication has been achieved through everyone working towards clear text communication. And, like any raiding group, we’ve had our share of drama. We all found it stressful at points, there were clashes and strains. Heck, it was just two weeks ago while we were learning the Lich King fight that one of our Herd Friends suddenly dropped news that he was going to another guild. 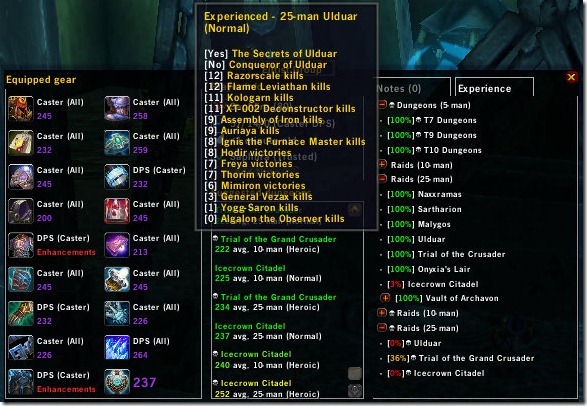 Ulram (bear tank) – managed to overcome finding tanking really stressful to do a perfect job with crazy amounts going on – including finding the time to do extra hybrid crazystuff. Also came up with some cunning tactics including the last piece of the puzzle which got us through Vile Spirits to victory. Can put more varied inflections into the word “arse” than anyone else we know. Ekatrina (paladin tank) – and dedicated co-raid leader. Took to tanking like a foodie to the Fat Duck. Never made the same mistake twice; often didn’t make the same mistake once. Always knew where the fack to stand and tough enough to calmly eat Soul Reapers for breakfast in strict 10 man gear. Came up with the very practical (and immensely satisfying) idea of making us practice the Defile Dance with Tirion Fordring playing the role of Arthas. Pitil (discy priest) – started out a tad unconfident months ago: ended up as the healer performing the most complex and versatile role in LK fight – and professionally so. Also, our raid’s provisioner of cupcakes/vital provisions. Gorgakh (resto shaman) – rock solid. Always totally reliable and consummately calm, which in healers are nigh-godlike qualities. Even when he had a kitten attacking his foot. Thrakha (Fury warrior) – example of what someone *can* do if they really work to be the best. And inspired that in others too, keeping the tanks sharp 😉 Currently to the best of my knowledge raiding with three different guilds at once, with corresponding numbers of fish feasts. Urkra (Unholy DK) – went from being very unconfident as a wow player to topping our DPS meters and rarely making mistakes and keeping an open mind on play improvement and new tactics. Achieved all that on a non-official Hardmode: completing half of the bosses unable to talk on skype due to playing in the same room as his wife watching X-Factor. Nergalian (enhancement shaman) – Sharpest reactions of everyone despite a slightly different style of playing – and despite the kitten Conan, slayer of raids. Her bouncy multi-cultural pop music and fish feasts also kept us all going up on the Throne. Karkass (destro lock) – always cheerful and positive, which is a raid-saver at times. Also, always willing to be flexible on filling different roles, which in turn helped keep us all sane. Karkass’ brainwave of teleporting back from the Valkyr was also something of a lifesaver. Overall: Karkass the Lifesaver. Simbaria (survival hunter) – having missed most of ICC, he joined us at the last minute and picked the LK tactics up immediately and flawlessly. Impressive. Mimetir, aka Apeorsa, figured out every fight mechanic first time, bent the needle on the healing meter, pushed through raidleading challenges from a vanishing raid member to general stress levels, and NEVER STOOD IN DEFILE. Seriously, not once. So what now? A break from raid leading – just a couple of weeks to chill. Then in a couple of weeks we’re all meeting up for a Herd Moot/guild meet, and we’ll look to our next goal then, probably with the help of copious amounts of ale. Primordial Saronite is the item that’s required for the next level of crafting gear out of Icecrown. There’s all sorts of methods of picking up this stuff and our leadership’s been hard at work figuring out what our approach should be. There’s a few things that are high on the priority list. Shadowmourne, for one, requires over 20 of these. While going for another Legendary isn’t required, it makes a statement about the guild (not one but TWO Legendaries after all). Our tanks can get an early boost to their gear and not have to rely on random drops from the different bosses. The better those guys get, the easier time we’ll have moving forward. As we’re packing a number of sharpshooters in the raid (4 hunters), they’re also going to need some heavy artillery. The recipes for bullets and arrows will cost one Primordial Saronite to learn. There’s lots of different ways we can go about spending Primordial Saronite to maximize raider utility. We’re also interested to see how various groups handle the Primordial Saronite issue. We designed it so there isn’t necessarily a right way to handle the material and we don’t want to over-prescribe your social dynamics anyway. I found out over the weekend that Blizzard devs do read this blog. Wyn and Lodur kept bugging me and insisting that they did, but I remained a disbeliever until one of their guys pinged me on Twitter about it. That was too cool! Prioritizing Saronite to the tanks – Our tanks will get first crack at the Primordial Saronite that they need. The better their gear gets earlier on, the easier time we’ll have heading into Icecrown. I think they’re shooting for the boots first, but I can’t be sure of that yet. I’ve created a queue list on the forums where the tanks put down what they need (not necessarily what they want). I’m not sure how the legs are. If they beat the tier legs, then I’ll devote more Saronite to it. Until then, the queue list is just for the tanks and once they have all that is requied, the list will be opened up to the rest of the guild. Ammo recipes – This is another one for us but it won’t happen until later on. Not only do you need the Saronite, the engineers need the reputation to purchase the recipe. It’s Goblin and Gnomish right? One crafts bullets and the other does arrows? Once our engineers have the requisite reputation, we’ll send one their way as well. Shadowmourne – The Shadowmourne quest line is fairly extensive. The last step involves taking down Sindragosa which isn’t going to be anytime soon. Not only that, you have to perform a variety of tasks at different bosses (like standing in fires while surviving for a prolonged period of time). This step can wait a little longer before we invest. On the other hand, there is some speculation that you need to be on the opening quests before you get the Shadowfrost Shards from the bosses. We don’t know how often the drops are and there is no confirmation. To that end, we’ve decided to increase the chances we have of obtaining Saronite. Sundays have been opened up for a new alt raid. We’ve been doing this for a while now, but we’ve decided to lay down some ground rules for it. For one, there’s many players with nothing to do on Sunday nights. We could either jump on our alts and join a pug with a 50-50 shot of succeeding, or organize our own with a higher chance of it working out. We like having multiple geared characters! Our alts are almost as geared as our mains and it gives us a nice “break” from our normal duties that we have to do on our main characters. It’s nice for me to randomly destroy stuff on my Ret Paladin or my Elemental Shaman. As I said earlier, extra Primordial Saronite is a plus. We can channel the results of those into the main raid. Not only that, since they’re alts, the players that are comfortable with it can spend their Emblems of Frost that they have to purchase Saronite for their mains if they need to. Our main raids are overstaffed. We do this in order to ensure that we have enough players to raid. This inevitably means that some players are going to sit out during the week. I don’t want them to fall too far behind us in gear. So any main raiders that don’t get to come in during the week are able to come in on Sunday in order to use up their lockout period. At the very least, they’ll get some Emblems. We’re still working out loot systems for the time being. Last Sunday, when we walked into ToC 25, we had 23 alts in total. The other 2 were friends of the guild. The one thing that we’re lacking is another tank for our alt runs. If we can field a full crew for 25, then I can definitely apply loot council rules and prioritize main readers who need loot and balance it with the alts. If you’re a tank out there with nothing to do on a Sunday night, come and check us out. Of course, anyone who feels that they are exceptional healers and DPS are welcome to apply regardless. Let’s take down Arthas and move on to Deathwing already! I’ve come into the habit of walking into work, sitting down at my desk and getting ready for the day. The trick is, how I get ready for my day. I go through my morning routine: some coffee, a bagel or muffin. I wipe down my desk from the overnight guy’s late-night snack. I shoot the sh** with my co-workers about random stuff. After making sure the database is updated, I open up my browser, and I type www.mmo-champion.com. I find some good stuff there. I like laughing at the Blue responses to all the forum QQ. I see how we’re all getting nerfed or buffed. I’m “in the know” about which guild got the newest World First. Today, however, I saw something that significantly raised my geek factor. I love movie trailers. Big epic scenes with climactic music underneath. Awesome voiceovers and sweet editing. I gotta hand it to Kinaesthesia from the Vodka guild (US-Alterac Mountains) for some awesome work. Enjoy!! WARNING!! SPOILERS ARE IN THIS VIDEO!!! We’ve seen the mechanic in Trial of the Grand Crusader and it seems like it’s going to be implemented in Icecrown as well. When I was on the PTR, I saw the countdown at 3000. We were down to 2994 when the raid group was called. Again, this is why I’m in favour of being on the PTR often so I can waste my learning attempts there where it doesn’t matter. But that’s the tactician in me anyway. There’s been objection to using limited attempts as a means to make raids more difficult for players. It means every attempt means something and they cannot just be squandered away. A ceiling has been imposed on the amount of times a guild can throw themselves at bosses. This means that a guild who raids for 24 hours a week has no advantage over a guild that raids for 12 hours. They both have the same amount of chances to get the job done. The playing field has been leveled in such a way that guilds can’t simply just “brute force” their way through a raids and rely on a sheer number of attempts to do so. You can’t have players doing the same stupid things that cause them to die. 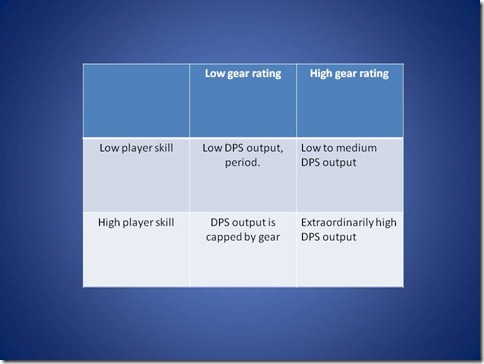 The overall skills have to go up. Granted, I’ll admit it is a cheap way of slowing down raids and making stuff harder. But I like this approach instead of throwing in more trash mobs. While ToC was one blend of the spectrum, I don’t think I’d be particularly happy if most boss chambers and corridors had quantities that rivalled Freya or General Vezax trash. I’d rather spend that time focusing on boss attempts. Some of the areas in ICC had trashed turned on. From what I’ve seen, it’s difficult enough to keep players entertained on the route to trash and there’s just enough where you’re not going to get bored of it and want to gouge your eyes out. Will there be a reward system? I’m not sure. It could be modelled after ToGC where the attempts remaining has an influence on the type of loot received. In fact, I think that is something they’ll implement. Did you like the way limited attempts were set up in ToGC? What would you change for Icecrown? Props to this guy for coining the term. Daelo announced earlier in the day the implementation of raid wide buff called Chill of the Throne. What does it do? The spell, called Chill of the Throne, will allow creatures to ignore 20% of the dodge chance of their melee targets. 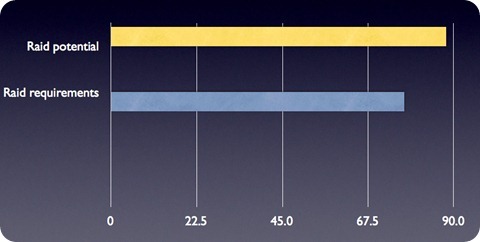 So if a raid’s main tank had 30% dodge normally, in Icecrown Citadel they will effectively have 10%. Similar in concept to Sunwell Radiance, the reason it was implemented was to lessen the overall spikiness of incoming tank damage. Spikiness refers to something like a tank taking constant streams of 15k damage here, 14k damage there, and then suddenly plummet after a 44k hit of some sort. Sometimes it was predictable and in other cases it was not. Itâ€™s a large and often unpredictable hit that is capable of flooring a player. I call it the Chuck Norris effect. For present healers, the current way to deal with this is to use defensive cooldowns in tandem with tanking cooldowns. If tank avoidance isnâ€™t high enough or if cooldowns arenâ€™t used, they can easily get 2 shot in a manner of seconds. With luck, this will be the last time weâ€™ll ever see a buff like this in the game. Going forward into Cataclysm, the idea is to raise the health pool of tanks. Right now our overall approach to healing is to spam really fast heals, really large heals, or AoE heals depending on the situation. While tank health pools go up, healing spells will scale up but not as sharply. The ratio of healing done on a tank vs tank health wonâ€™t appear to be the same as it is now. Letâ€™s say a Greater Heal can cover 60% of a tankâ€™s health right now. When Cataclysm hits, Greater Heal might only heal for 35% or something. The approach is to make overhealing a real risk to the point where healing spells canâ€™t be spammed just to get through the boss fight. Thatâ€™s going to present an interesting change. It feels as if itâ€™s going to be a hybrid between Vanilla-esque healing and TBC-era healing. I daresay those were the two extremes. In Vanilla, you had to rotate out with other healers and regen for a minute before tagging back in. 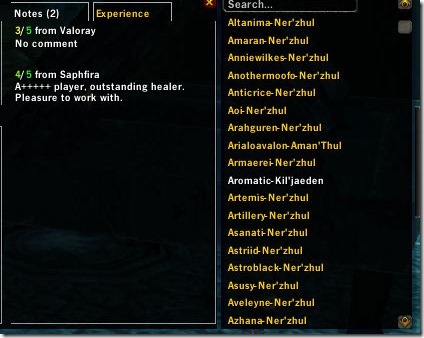 In Burning Crusade, you could get away with Circle of Healing spam. It looks like in Cataclysm, they just might make overhealing mean something again since we canâ€™t spam heals nor can we switch out with other healers to come in for us. Just a quick post today on the recent changes to the PTR. * Sons of Hodir quests now give more reputation overall. * Top-level helm and shoulder faction-related enchants are now available as Bind-on-Account items that do not require any faction to use once purchased (they still require the appropriate faction level to purchase). * Reputation commendations can now be purchased for 1 Emblem of Triumph each. This is a fairly sizable upgrade for us. Not only is rep grinding reduced greatly but once you get someone exalted with sons for example they can buy the shoulder enchant and send it to another character of yours. As an alt-aholic I love this idea. The change to rejuvenation is great for players who are leveling. It adds 3 seconds pretty much across the board. The Shaman changes to reincarnation and the improved reincarnation talent make me very, very happy. I might actually find 2 points to put in it. Being able to self resurrect every 15 minutes is a great boon for progression night raids as well as just leveling. Toss in a Glyph of Renewed Life and you’re pretty much gtg. Glyph of Rapid Rejuvenation: This glyph allows for the druidâ€™s haste to reduce the time between the periodic healing effects of Rejuvenation. That’s some of the major changes this build. Hope you get a chance to play with the PTR a little bit. What are your thought’s on the PTR so far? How do you think patch 3.3 is shaping up? Also be sure to follow me on Twitter for up to the minute updates as they filter through.